The competing robot may topple over. The competing robot may have its wheels lifted from the ground, and no longer be able to push back. The competing robot’s weight will shift from its wheels to your wheels, providing your robot with increased traction. Roundabout Sumo has a large wedge and does reasonably well. It won second place in two separate ChiBots contests. In the spring, it eventually lost to Mike Davey’s wedge robot (Sorry, I’ve forgotten the name. Red’s Dream? Something Cheese? Continuous Wedge?) after a bunch of tiebreakers (a “win-by-two” final round). In the fall, Roundabout Sumo quickly lost to No.2. Wedge-based or scoop-based robots are not difficult to build and they are generally the most successful. So, everybody builds one. A sumo robot with multiple arms can nullify a wedge robot by riding up the wedge to find a place to push. Aside: No.2 is on the left. Roundabout Sumo is on the right. 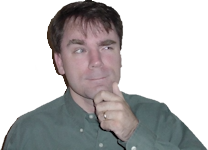 Notice Roundabout Sumo’s bulging emitter eyes? That’s what got knocked out of alignment in the spring competition. No.2 is named for the FaberCastell American No.2 pencils that make up its offense. Each pencil rides loosely in the robot’s front comb. Upon colliding with an opponent, the soft eraser tip slides up the competitor until it finds a nook or cranny to grab hold. All it takes is one pencil to hold back the opposing robot, thus preventing the wedge from coming into play. 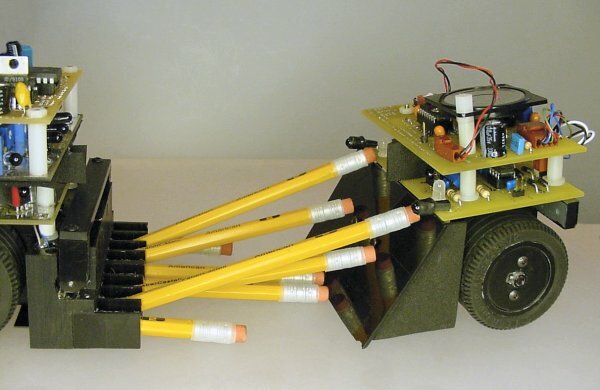 To eliminate the effectiveness of the pencils, one would need to create a wedge robot with an ultra-slick surface with no openings on the front or the side. The opponent would need to have rounded sides or would need to hit No.2 perfectly square on, every time, otherwise it would likely catch on a pencil or the front comb. Pencils are lightweight, which is particularly important in a contest with weight limits. Pencils can be easily modified / machined. Pencils have a grippy rubber eraser tip. Pencils are attractive and add an appealing visual element to the robot. No.2 drops its pencil arms down at the beginning of a mini-sumo robot battle. On the right side of the above picture, notice the different lengths of pencils. The diverse spread pattern of the pencils is designed to maximize opportunities to strike. If one length of pencils misses the opponent robot (because it is turning or something), the other lengths get another chance. The shortest length of pencil is on each side, to accommodate the occasions when No.2 rotates into an opponent. The robot sumo rules state the maximum width and length that a robot may occupy at the start of a round. However, when the battle begins, the robots may change shape or orientation. No.2 starts with its pencils raised to meet the limits on dimensions. Then, after the five-second delay required in the rules, the match begins and a motor snaps the pencils down. The pencils float freely after that, so that they can ride up the front of an opponent. If the pencils were held firmly down, an opponent’s scoop could get under the pencils and lift up No.2. 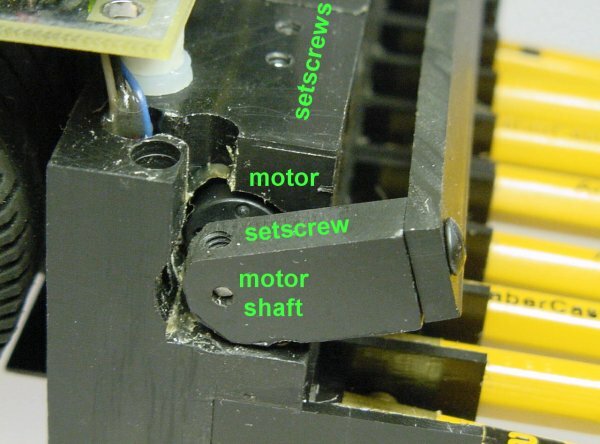 A miniature Maxon> DC motor held in place by setscrews operates the drop-down bar on the robot. A 12 mm diameter Maxon DC gearmotor is held in place by a couple of setscrews. The shaft of the motor attaches to the drop-down bar by a single setscrew. There is a tiny little gearbox on the motor that is approximately 7:1 gear ratio or less. (I don’t know the exact specifications because I purchased the motors from an eBay auction.) Although some torque is necessary to drop the pencils, speed is more critical as the robot is vulnerable in the “pencil up” orientation. There’s another good reason to only use a little gearing on the motor: there aren’t any sensors to detect when the pencils have been deployed. The motor simply receives full power for a brief amount of time (less than 1 second). If the motor happens to receive too much power, it will stall as the drop-down bar pushes against the edge of the front of the robot. If the motor had stronger gearing, it might break the bar or the gears. Instead, it just wastes a little bit of energy in the stalled position. 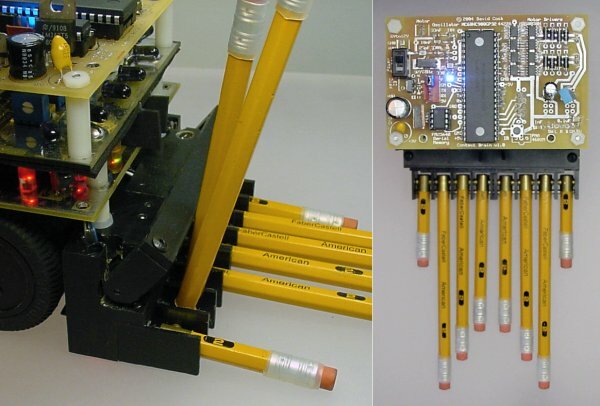 The microcontroller can only turn the motor in one direction (deploy pencils only). I didn’t bother to implement a full bi-directional h-bridge motor driver for this motor, since I was going to have to pull all the pencils up at the end of the match anyway. Instead, an n-channel MOSFET transistor drives the motor. I didn’t even bother to add a diode -- the body diode of the MOSFET should be acceptable for intermittent low-voltage use.